This is the track that will be used for round 11 of the 2013 Motosport World Grand Prix series. High-res with shaders: will be added later. - Download the versions you want and extract in your personal folder. - If you've downloaded and extracted several versions just add a .bak extension to the filenames of the versions that you don't want to use. Sweet! Can't wait to ride! Great track ! Thanks for doing this guys! Def one of the best track from you guys, haqq and rafagas! Always a fan! Love the track, but the only thing I can't stand is on some of the exits from the outside ruts the bales are horizontal going onto the track, and it's literally right in the outside lines. You guys nailed it. I'm really impressed to see that even though you should be exhausted by now after all the tracks you made this year, you keep improving every week. I feel like you have developed and perfected your own style which is a perfect balance between roughness and fun/speed. Even if you removed all the banners and decals everyone would be able to recognize your touch which for me is the most realistic feeling while riding. Don't get me wrong, St Jean was a great track too, but if you had to compare it to the current tracks you build it wouldn't be on the same level. It's also the same for the decals and objects, I don't know if it was what you were aiming for but even if it can look a bit dull and colorless at first, after a few laps this first impression is replaced by the same impression you get when watching a video shot with a flat picture style, way more realistic and detailed. The only thing I wasn't a big fan of is the blueish lighting you used on a few tracks but that could be the fact that I play on a wide gamut monitor which makes everything over saturated since the game isn't color managed. I couldn't say your the best duo of track makers out there as I love different styles too but you would definitely be up there for doing something different, of very high quality which is still improving every week thanks to you learning from your mistakes and listening to user feedback. I know you still have a long way to go to finish the series but I have no doubt you'll keep impressing us, so congratulations on probably the most amazing 2 man effort of the game to date. I feel like the ruts could be a little more vertical but other than that great job! Axionkt wrote: I feel like you have developed and perfected your own style which is a perfect balance between roughness and fun/speed. That is the key to success. Rafagas has learned a lot with Haggqvist, he has improved his ability to make rougher tracks. And to this is added the fact that he is one of the best "flow and rideable" track makers, his jumps are simply perfect. On the other hand Haggqvist is the king of the job. But he loves to see us suffer on the track, his tracks are always the roughest but when he wants to make a track "rideable", that will be one of the best tracks. For example Valkenswaard or Kegums. I'm pretty sure he has learned too with Rafagas, because he makes his tracks smoother. So there is the perfect balance. Congratulations to Rafagas and Haggqvist. Thanks for the comments. Really appreciate them. 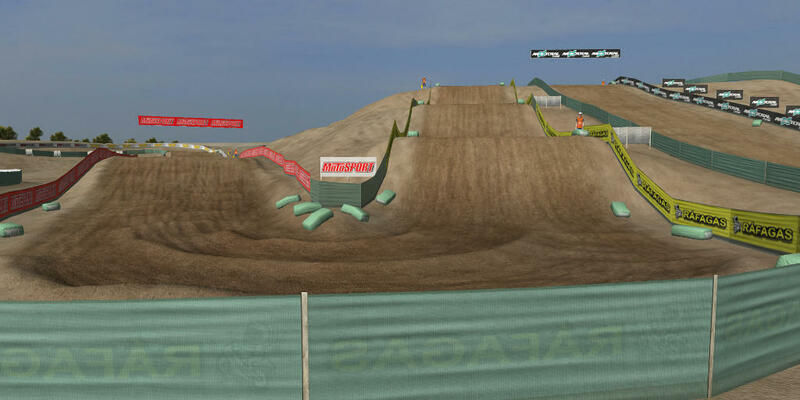 MXJProductions wrote: Love the track, but the only thing I can't stand is on some of the exits from the outside ruts the bales are horizontal going onto the track, and it's literally right in the outside lines. You are right. I don't like that either but if we remove those bales, people will cut and jump out of the track limits. Believe me, I hate playing CSI trying to figure out where people are going to cut. Awesome track, love the realistic feel! Some corners are tricky with the haybales tho' haha.